UPDATE: SHAUN Green should be driving around in the work ute he saved up for and brought just two weeks ago. Instead he spent Friday salvaging what he could from the cab after thieves stole his white Holden Commodore ute and drove it into an irrigation channel. To make the situation worse, the car was stolen from Mr Green's North Bundaberg home on his birthday while he was inside watching TV. "This is the work car, I only picked it up two weeks ago," he said. "I thought I got a good deal too but it hasn't worked out too well." Mr Green had no idea the ute had been stolen until Friday morning. After reporting it he was informed by police that a white ute had been dumped in the irrigation channel off the Ring Rd near the Goodwood Rd intersection. 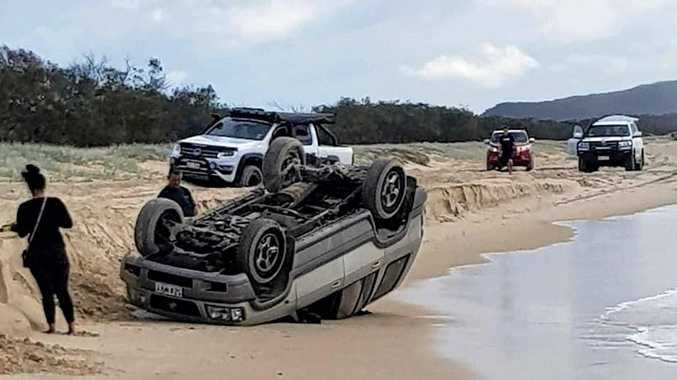 Bundaberg Police confirmed the submerged car was reported about 6.30am yesterday morning and investigations were underway when they received the report from Mr Green. 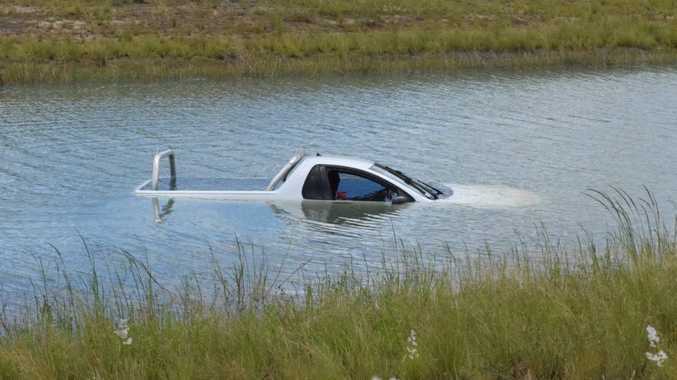 With the ute underwater above the windows and the engine completely under water, the car is a write-off. Luckily Mr Green had a friend who was able to tow it out of the channel. He could only watch on as water drained from the cab and tray as it was pulled out of the water. Mr Green said he spoke with his neighbours Friday morning who said they saw the ute being pushed down Hopton Place Thursday night but didn't realise it was being stolen. "The neighbours actually saw them. They might have thought I was trying to push start it," he said. "They came over and said sorry and said that they saw someone pushing it. They said it happened pretty quick. They pushed it down the street, jumped in it and took off. "I asked if they had a description but it was dark, they didn't see much." Mr Green said it was about 10pm and the car was parked just 10m from where he was inside watching TV. While Mr Green didn't have to pay a tow truck to remove the ute thanks to a mate, he said it was pretty rough for anyone who had a car stolen to then be up for the costs the retrieve it. "Something should be done for people who lose their cars, there should be some sort of towing," he said. Police investigations into the matter are continuing, anyone with information is urged call Bundaberg Police on 4153 9111 or Crime Stoppers on 1800 333 000. EARLIER: BUNDABERG Police are investigating after a white ute was found in an irrigation this morning. Police received multiple calls about the white ute which appears to have been driven into the irrigation channel off the Ring Rd near the Goodwood Rd intersection sometime overnight. The ute is believed to be stolen.